Yesterday, we left early to try and beat the heat for a pre-ride to Vicksburg and a route mapping for the upcoming Recumbent Rally in May. Hey! Look at me! (short video) Sure, Doug Morgan’s reflective vest and bright lights show up well at night, but the bright colors and lights also work well in the bright sunshine and shadows! So, when we ride the Trace and barely see cyclists in dark colors, it begs the question. Why? Of course, the reds and blues look good on the design screen, and on the dummies in the ads, but why would any safety minded designer use these colors for jerseys to wear out in the distracted public? They appear black in the distance and in the shadows! When your lights fail, you are invisible! We don’t blame the cyclists all the time, because some of these jerseys were earned, but we should hold the jersey designers accountable. There are plenty of patterns and designs that can be based on the high-vis lime green or yellow background. And, if just one accident, or life is spared . . . Recently, the Little Mountain ride was held near Kosiusko to honor Dr. Holdiness, who had been a customer of ours. Like Gary, thousands of cyclists have ridden on the Natchez Trace almost daily because it is the safest and most scenic place to ride in the country! Here is a pic of Dr. Russell Rooks at the summit of that ride on his recumbent! Way to go, Russell! This is a GOOD story! Now, we don’t profess to know all the answers. Heck, we don’t even know many of the questions! But, we do know that to survive, you have a better chance if you are as visible as you can be . . . and ride as if you are invisible! If you can distract the drivers from their distractions, just long enough for them to get around you safely, well, you have done your job. 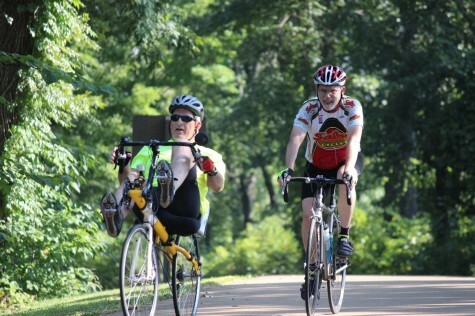 If you choose to ride a recumbent, stay tuned for the Recumbent Rally and Convention to be based in Flowood, Mississippi May 1-9 2015! There will be sessions for all BentLovers to participate in! Put the dates on your calendar. We are almost ready to publish our events page for you to sign up on, so stay tuned, and stay safe! Next post: Are you any better?